After enjoying almost normal relations for 20 years, tension between the UK and Argentina is escalating over the Falkland Islands. This time, the row concerns an estimated 60 billion barrels of oil and natural gas deposits off the South Atlantic archipelago, occupied by the UK since 1833. 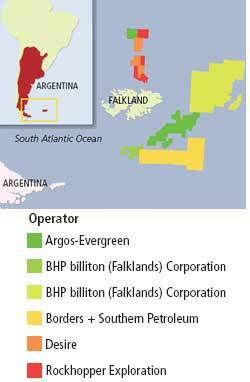 Days after a British company, Desire Petroleum, sent a drilling rig to explore oil off the Falklands, Buenos Aires tightened its control over shipping in the region and announced all ships sailing through its waters would require permits. The Argentine foreign ministry issued a statement of protest saying the north Falkland basin is in areas of the Argentine continental shelf and the UK should not carry out exploration activities there. It now plans to approach the UN to assert its longstanding sovereignty claim over the Falklands. In response to the rising tension, the UK has sent its warships on patrol off the islands. In 1982, Argentina attempted to take over the islands by force, which had triggered a brief war between the two. Ahead of long-delayed talks over a free-trade agreement with China, Australia reacted cautiously to the news that Beijing has indicted four Australians working for mining giant Rio Tinto on charges of bribery and industrial espionage. Canberra has urged Beijing to handle their prosecution “transparently and expeditiously”. The employees, including the lead iron ore negotiator in China Stern Hu (an Australian citizen), were detained in July 2009 just weeks after Rio Tinto walked away from a major deal with China’s state-owned mining company Chinalco. The deal would have given China greater access to Australia’s vast resources. The case had briefly snapped diplomatic ties between China and Australia. Rio Tinto has said it wants to build ties with Beijing because of the country’s growing demand for raw materials, particularly ion ore. The change in Rio Tinto’s stance comes as the iron ore price negotiations are set to start for the 2010-2011 financial year. Rio Tinto is the world’s second biggest producer of iron ore and China is its largest consumer. 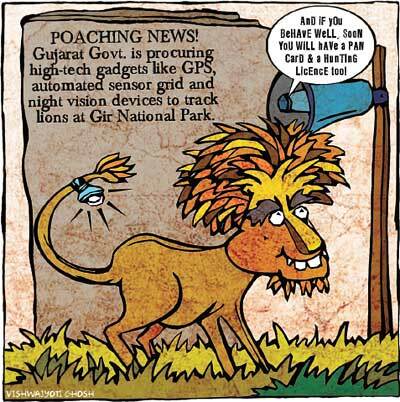 International watchdog Global Witness is calling for the cellular phone industry to beware of conflict metals—rare earths and valuable minerals sourced from conflict zones. Speaking at the Mobile World Congress, Global Witness said several electronic companies source metals like tin, tantalum, tungsten and gold from eastern Democratic Republic of Congo (drc), where the mines are controlled by armed militias. The UN passed a resolution in December that allows for asset freeze and travel ban on companies that support armed groups in the drc. Anti-whaling activists in the Antarctic Ocean threw butyric acid and fired paint guns at a Japanese whaler, which then repelled the protesters with water cannons. The clash is the latest in an ongoing feud between Japanese whaling fleets and conservation groups, especially the hardline Sea Shepherd. Japan’s fisheries ministry accused Sea Shepherd of jeopardizing the safety of its fleets conducting research. Though commercial whaling is banned, Japan is allowed limited whaling for research. Critics say it is a pretext for retrieving whale meat to be sold in markets. Japan’s Asia Pacific ally, Australia, has warned it to end the whaling programme or face international legal action. The world’s biggest mud volcano in Indonesia, Lusi, which has killed scores of people and displaced 50,000 since it erupted in 2006, was caused by drilling at a gas exploration well. Scientists have provided the strongest evidence yet linking the role of energy firm Lapinado Brantas in the disaster. The team, led by UK’s Durham University, analyzed Lapinado’s drilling reports and said the disaster was caused by critical drilling errors, which includes pulling the drill string and drill bit (cutting tools) out of the bore hole while it was unstable. This ruptured the well, causing influx of water and gas from surrounding rock formations. 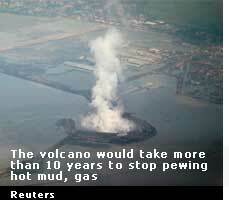 The company pumped heavy drilling mud into the exploration well to stop the influx and the eruption had slowed down. This shows the borehole was connected to the volcano, the scientists said. The company argues the volcano was triggered by an earthquake. In 2009, Indonesia’s supreme court acquitted Lapinado for lack of evidence. With Finland’s approval, Russia acquired the last permit required to start the construction of the Nord Stream natural gas pipeline that would pass through the Baltic Sea. The 1,223 km twin pipeline system is important for Moscow to diversify its energy export routes to Europe; when completed in 2012 it would transport 55 billion cubic metres of gas a year. Green groups claim the project would devastate the Baltic’s already fragile marine ecosystem. wwf (Germany), Estonian Fund for Nature (Finland) and Estonian Naturalists Society (Denmark ) have filed legal challenges to halt the project. The Baltic, one of the world’s most polluted seas, is a sink for untreated sewage and ammunition chemicals from the World War II era. Activists fear construction work could stir the toxins lying on the seabed. The shortage of a medical isotope used in diagnostic tests for heart diseases and cancer is about to get worse. Two nuclear reactors supplying two-thirds of the world’s supply of molybdenum-99 (99Mo)—one in Canada and the other in the Netherlands—have been closed for repairs and maintenance until August. 99Mo decays to yield the short-lived isotope technetium-99m (99mTc), which is used in 70,000 medical imaging procedures every day, including bone and heart scans. The short half-lives of 99Mo and 99mTc mean supplies cannot be stockpiled. Several smaller reactors have stepped up to cover the shortage. Analysts say it may not be sufficient. France’s military used soldiers as guinea pigs in nuclear tests in the 1960s, deliberately exposing them to radiation from atomic blasts to study resulting physical and psychological effects, according to a secret military report published by French daily Le Parisien. 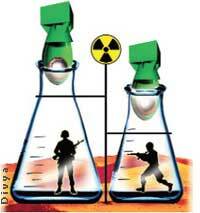 The exposure of French troops to nuclear radiation during weapons tests was known. The 1998 report shows they were intentionally exposed. The report cites one operation in 1961 that involved troops advancing to within a few hundred metres of the epicentre of a nuclear blast immediately after detonation without protective gear and stayed there for 45 minutes. “The results showed at 800 metres from point zero and outside the fall-out zone, the combatant was physically able to continue fighting,” the report noted. The report comes to light at a time when war veterans are lobbying to include more illnesses in the compensation bill that the government passed after decades of political bickering. The veterans complain of multiple unexplained cancers. France conducted 210 nuclear weapons tests in Algeria and French Polynesia from 1960 to 1996. About 150,000 military personnel and civilians may have suffered as a result. Ethiopia called a public meeting to hear objections to a biodiversity law that aims to protect the country’s rich biodiversity from the genetically modified (GM) crops. The parliament passed the law in 2009 without debate. Several farmers groups and scientists objected to the law saying its provisions choke off funding for GM research. The agriculture minister said the government is not convinced by the evidence that GM crops are safe and advised researchers to test the law before calling for its repeal. Earlier the government had amended the law temporarily allowing GM food aid for the country’s 4.6 million hungry people.